Black Friday wouldn’t seem like the ideal day to release a report as important as this, but there it is. This report is Part 2, covering Risks, Impacts and Adaptation in the US. It is based on a massive amount of scientific study, as detailed in Part 1, which was released last year. For those who don’t have time to read it, the short version is that things are going to get really bad soon in many parts of the US if we don’t turn this car around. Fires, floods, coastal erosion & flooding and declining property values along the coast, climate refugees, heat waves that kill people, infrastructure collapse, agricultural failures with decreasing food security and increasing food prices, and so on. And the knock-on effects of all that will impact places and industries that maybe aren’t feeling direct effects, so the economy will shrink. Not a pretty picture. It won’t be just Arctic peoples’ cultural heritage and valuable scientific information that gets lost. It will be public infrastructure and homes and food sources and drinking water. The problems that we are seeing here in North Alaska now will most likely be coming to a place near you soon if enough isn’t done to change things. This really isn’t the sort of thing to be gambling on. The way it is set up, you can download executive summaries of the whole thing and of each chapter, but not the whole report or whole chapters. They have to be read online. Not much thought given to folks who live in rural communities with low bandwidth and/or super expensive internet ($299/month for 5Mb/sec and a 100GB data cap anyone). If it could be downloaded, costs and the downloaded documents could be shared. I’m back from over a month in the field, and just got the Committee on Climate Change Strategies and Archaeological Resources (CCSAR)-sponsored session set up for next spring’s SAA meetings. The session abstract is here. We are looking for papers. If you are interested and have a paper you think might fit, contact me! NB. The hard deadline is coming up fast (September 6, at 3PM ET) and you will need to be registered and with fees paid to be accepted. You don’t have to renew/establish your SAA membership right now, but will need to do that by the end of January 2019 to give the paper. SO late last year I submitted a session proposal on Environmental Change Threats to Alaskan Cultural Heritage. I never heard anything, so I assumed the session wasn’t accepted and what with the holidays & the knee replacement, I didn’t try to solicit papers. I just learned that the session was accepted, so I am looking for participants. The organizers are being kind enough to give us a couple of extra days past tomorrow’s deadline, but this has a pretty short fuse. The abstract is linked here, but in short, I want to get a conversation started about this issue. In many ways, Alaska has more at risk, sooner, than most of the rest of the US or most of the rest of the world, but we seem to be responding more slowly than places like Scotland or Florida or California. I am hoping for papers that either highlight sites that are being or have been destroyed (you don’t need to have completed excavation & analysis), or showcase specific ways that communities, agencies and/or archaeologists have tried to deal with the issue. We should have time after the papers to actually start a discussion on ways to deal with this problem beyond simply noticing it exists. Please send abstracts to me (amjuics@gmail.com) and to Andy Tremayne (Andrew_Tremayne@nps.gov). Contact me (amjuics@gmail.com) if you have any questions. This past week, the remaining crew have been working to get equipment cleaned & stored. We dried several tents, dried and hung up jackets, dried and got the sand off a lot of equipment, and sorted the remaining food. We were going to donate it to the common pool, but there were already 8 bottles of mustard in the refrigerator, so we’ll store that for next year. I’ve been working on both project equipment and my personal gear. My dishwasher is full of coffeepots & plates, which will get stored for the winter. I’ve washed the tent and blanket Garrett Knudsen was kind enough to leave, which was used by several other crew members, and will be mailing it on Monday, along with a few souvenirs that crew members didn’t manage to pack. I’ve also washed a pile of assorted gloves. I’ve still got a UICS sleeping bag to wash and dry, and some down jackets to drop off at the dry cleaner. I have been washing field clothes since I got home. I spent the weekend washing and drying two sleeping bags (one that I used, and a spare that one of the crew members used, cleaning and packing two Thermarests (ditto), and washing and renewing the waterproofing on my tent & fly. I’ve still got to rewash the chairs I loaned the project. The crew power washed the crushed mosquitos off them, but they wound up muddy, so I’ve got to wash them again. Putting gear away until the next time I head for the field. We got into town late last Thursday. The field season went pretty well, after a slow start due to ice preventing us from getting out. We lost a few days to major storms, but we had a great crew and accomplished a lot. Breaking camp was a bit of a challenge, since we were down to seven people in the field. The big boat was scheduled to arrive at 9AM, so we broke everything down the day before except for the mess tent and the latrine, plus our sleeping tents. Then we got up at 6 AM and took down all the sleeping tents, and started ferrying gear to the beach with the ATV & trailer. It turned out the boat ramp wasn’t in the water back in town, so the boat didn’t make it until nearly 1PM, after having to launch into Elson Lagoon and go around Point Barrow. It was a cold morning, and once we had stuff packed, it was hard to stay warm, especially since we’d dressed for hard work and packed up everything else. At one point, several of the crew were napping in a ditch. The boat had to make two trips, so we sent 3 people up with the first load, and then 3 more with the second. I drove the ATV & Tubby back to town, so I was the last one in. I left before the boat, but Doctor Island is pretty fast, and I was riding into a north wind and kept meeting people and stopping to chat, so they beat me home. Loading the boat. Photo courtesy of Zac Peterson. Heading home. Photo courtesy of Zac Peterson. Our first day back was the last day of the UIC Science Fair, and the archaeology lab was featured tour. Also I had a presentation scheduled. Everyone was really tired, but we managed to pull things together for a good tour, and in fact had visitors well past the scheduled end of tours. The presentation was well attended. As I write this, another early storm with winds from the West is brewing, with predictions of coastal erosion. We have been getting gear ready for days. The next challenge is to get it (and ourselves) to the field. The weather and equipment have not been cooperating. The shore fast ice is just really melting this week, so we hadn’t been able to take anything down before. Then the wind changed to the west, leading to one helicopter-assisted rescue in front of my house and ice against the shore. We staged gear in the “yellow shed” (a small warehouse shared by archaeology and the ARM program) and we waited. Yesterday, the wind went east for a bit and pushed the ice off the beach, so we rushed to load the UIC Science boat Crescent Island and sent heavy, durable & waterproof things down to the site. Four of the crew went along and they and the two UICS logistics staff who were running the boat put the stuff in a secure spot and headed home just as the wind changed back. They made it before the ice came back in. Crescent Island loaded up at NARL. The John Deere is just for moving her and a sister boat, and is the only tractor in town. Crescent Island under way on her first working trip for UIC Science. Today, the wind wasn’t as strong as predicted, so Kaare and a bunch of the crew were going to head down with a little more gear, set up tents, and Ben Fitzhugh, Garrett Knudsen, Zac Peterson & Katie Daniels were going to stay and start stripping sod. We packed up after lunch, but various ATVs decided to not behave (one only wanted to run well in reverse) so it took a while. Kaare loading the trailer while Zac looks on. Garrett and Katie getting ready to bring up the rear (and pick up anything that falls off). By the time they got to Nunavak it was pretty late, and the stream was still really deep to cross, but it was draining, so they came home and will try again tomorrow. We may try to do two trips to get more folks down, but there will be one more boat trip Sunday or Monday, so some folks will go down that way. Meanwhile, I had discovered that the newly-returned batteries for the transit were really not in as good shape as the tests at the surveying equipment shop indicated. I spent some time chasing down replacement batteries. In the end, GPS Alaska had a charger for the new batteries in stock, could order me new batteries, and had two that they use which they are renting to us at a very low price until our come in and get shipped to us. My boss is in Anchorage and going to fly his plane up, so he was able to pick them up and bring them along. All the other stuff is in decent shape, so we should be able to work and record what we are doing. I’ve been working on dating the various samples from the WALRUS project. Since walruses are marine mammals, direct C14 dating is problematic. In fact, that is one of the things we are looking at with the project. We ran a number of sample pairs of walrus and terrestrial material and compared the offsets. The bad news, there is not just one offset. For some sites, we have very little information beyond the mound or midden square from which the samples came, or the depth of the arbitrary level they were excavated from. For others, we have more detailed stratigraphic information. I’ve been developing schematic descriptions of stratigraphy for the sites from which we have samples , using the Harris Matrix as a means of representation. Some of these are relatively easy to do and others are more complex. For simplicity’s sake I have only been including sampled contexts in the Harris matrices, although someday I can add other excavated units. The one on the left below is from a site where we have little information on most mounds (we have samples from six), and those we do have info on were apparently dug in arbitrary levels, as far as can be told from the field notes. The one on the right shows the two sampled mounds from a site where I have extremely detailed provenience information. These help me check that the dates we have are consistent with the stratigraphy, and are helpful in construction of more complex dating models in OxCal. The process helps me think about how the models should be built, and also serves as a bit of a check, since having a crude model with some dates makes it easier to spot cases where a complex model may have been specified incorrectly (and therefore is giving incorrect results). 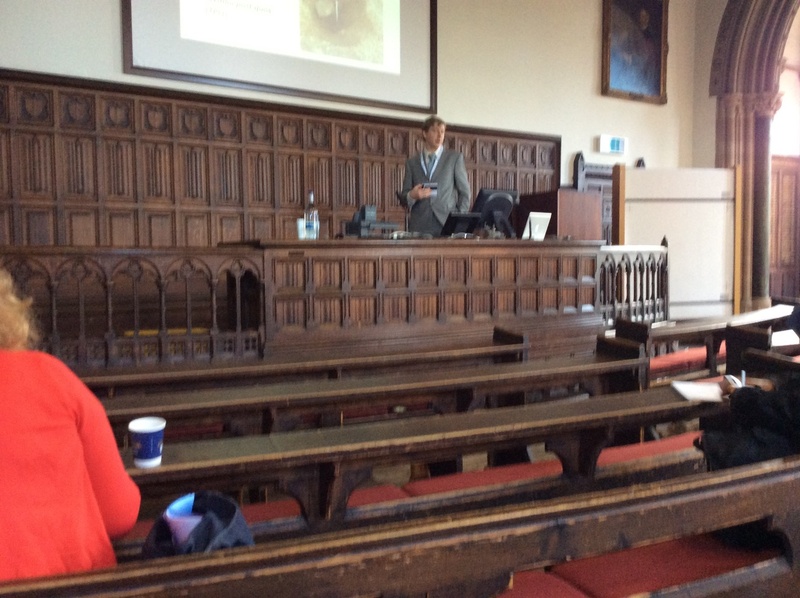 I spent most of the day talking about climate change threats to cultural heritage and archaeological resources. I started off at a fairly conventional session about archaeology at various sites in Alaska and the Pacific Northwest, which had a number of interesting papers, many based on analysis of well-preserved faunal remains. I then went on to the first formal meeting of the newest SAA committee, on Climate Change Strategies and Archaeological Response (CCSAR). Dan Sandweiss, who is the SAA board liaison, as well as being one of the earlier people to call attention to the importance of archaeological sites as archives of paleoenvironmental data, as well as the obvious archaeological data. It seems to be a really great group of people,working in a lot of different places, all of which are having some climate issues. Most of them are interested not only in saving data, but in what that data can tell us about past climates, and about how people adapted to changes in them. As one person said, “We really don’t have much data about the Archaic, the last time people lived sustainably in North America.” This may be a bit of an exaggeration, especially for Alaska, but basically the idea is correct. After that, I had to go to an appointment in the book room. We will see what comes of that in due time. Then there was another interesting session on Heritage Tools for Tackling Climate Change. This included a variety of talks on ways people are dealing with the effects of climate change. One had to do with melting ice patches in Glacier National Park, and how the Park Service had dealt with material coming out, in consultation with the local Native American community, as well as studies they were doing so they could be proactive. Another paper included information on the California Cultural Resource Management (CRM) community’s efforts to get public lands on the coast surveyed completely. There was some discussion about whether the US ban on revealing any site location data helps or hurts. Most other countries will reveal that data, although they may wait until very valuable materials have been properly excavated in some cases. They have found that it decreases looting, if anything. It also helps people avoid inadvertent damage that happens when people don’t know a site is there, and lets them report on changes in site conditions. So instead of a few archaeologists, lots of people can keep an eye on the sites. Here they can’t do that. I suspect, as do many others, that the people who are serious looters already know where the sites are, and have a pretty good idea where to prospect for more. On the other hand, when the US government shut down for a couple of weeks in 2013, looting exploded in the National Parks. Tomorrow morning the session I organized on Global Change Threats to the Archaeological and Paleoecological Record (not snappy, but lots of buzzwords for search engines) happens. I spent most of the week in Seattle at the Arctic Observing Open Science meeting. Ben Fitzhugh and I were the point persons for the broader GHEA/IHOPE Emerging Knowledge Hub on Global Environmental Change Threats to Heritage and Long Term Observing Networks of the Past. This is a long and fancy way of talking about the threats that sea level rise, ice retreat, and permafrost warming pose for archaeological sites in the North. Since this was not an archaeological meeting, most of the folks were either natural scientists or resource managers. We focused on the kind of data that archaeological sites contain that are more than relevant to answering the kinds of questions they are asking, while pointing out that the data is vanishing quickly. The library is on fire! 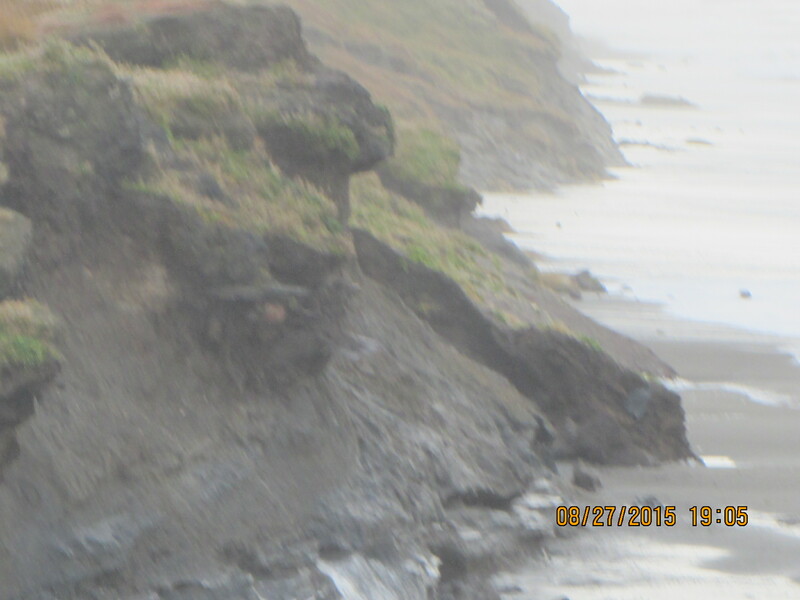 Waves eat at the Utqiaġvik bluffs. Ben and I each were the lead on a talk (both massively multi-authored), and we also did a poster, with a similarly large number of contributors. Ben’s talk was in the Marine Ecosystems session. It seemed like it interested the audience, which was primarily oceanographers, and related agency and funding folks. Mine was in the Human Dimensions session, since the Coastal Processes session we had aimed for apparently didn’t get enough papers. I followed a paper on frozen heritage (primarily ice patches and the preliminary stages of development of site evaluation schema) by Martin Callanan and Shelby Anderson, so the issues were thoroughly driven home. The audience included a number of natural scientists (! ), and the discussions included the relevance of archaeology to both other fields of research and to developing toolkits for sustainability. Our hope is we woke some of our colleagues up to both the potential of archaeological sites to provide data, and the need to find a way to get that data that doesn’t rely entirely on Arctic Social Science funding. My talk and the poster are up on both my Academia.edu and ResearchGate pages, if you would like to see them. I’ve spent the last month writing almost non-stop. However, none of it was posts on here. We had done a number of CRM projects this summer, and the results had to be written up. Five reports later, that is more or less done, pending a couple of possible new illustrations. I’m working on a couple of projects for a client who is in the early stages of planning some big infrastructure projects. Instead of waiting until the design and site selection is nearly complete and then considering cultural resources, which often leads to unfortunate surprises, unnecessary expenses and project delays (which are then blamed on archaeology instead of poor project planning), they are actually trying to get a handle on what cultural resources might be located in the possible Area of Potential Effect (APE) and what dealing with them appropriately might entail. This seems like a way better approach and should be a win-win. This weekend, I’m working on a paper and a poster for the Arctic Observing Open Science Meeting in Seattle in 2 weeks. I had hoped to give the paper in a proposed Coastal session, but apparently there weren’t that many coastal papers, so it looks like I’ll be in the Human Dimensions session. Sort of ironic, given that I’m talking about the paleoenvironmental data that Arctic sites can contain, and how that data is at imminent risk of being destroyed by global change effects, and pretty much taking the human dimension information potential as a given. That’s pretty much been the basic premise of archaeology since the days of CJ Thomsen & JJA Worsaae. I’m spending a part of next week in Anchorage, so I want to get it more or less done before I go. 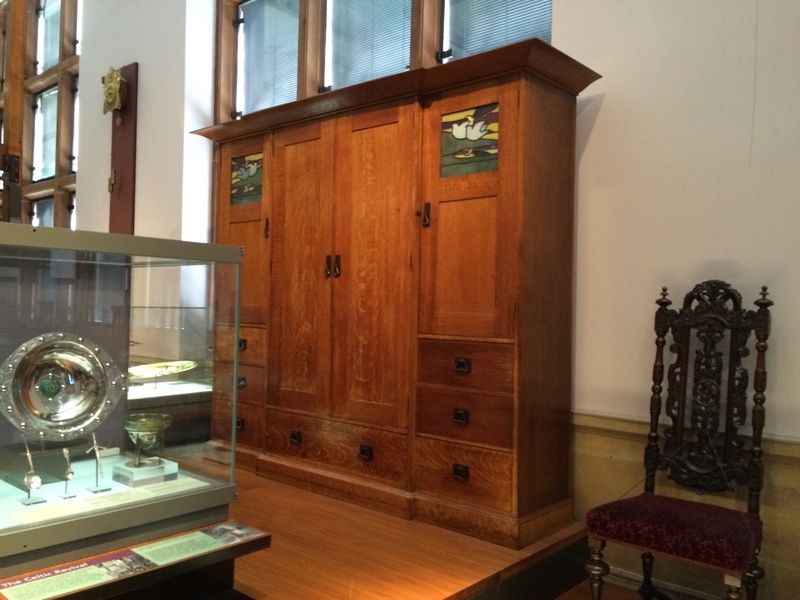 We went to Glasgow where the 2014 European Archaeology Association was held, by way of Anchorage and Reykjavik. Because flights from Barrow are disrupted fairly frequently, we went down a bit early, and had a chance to visit with our daughter. 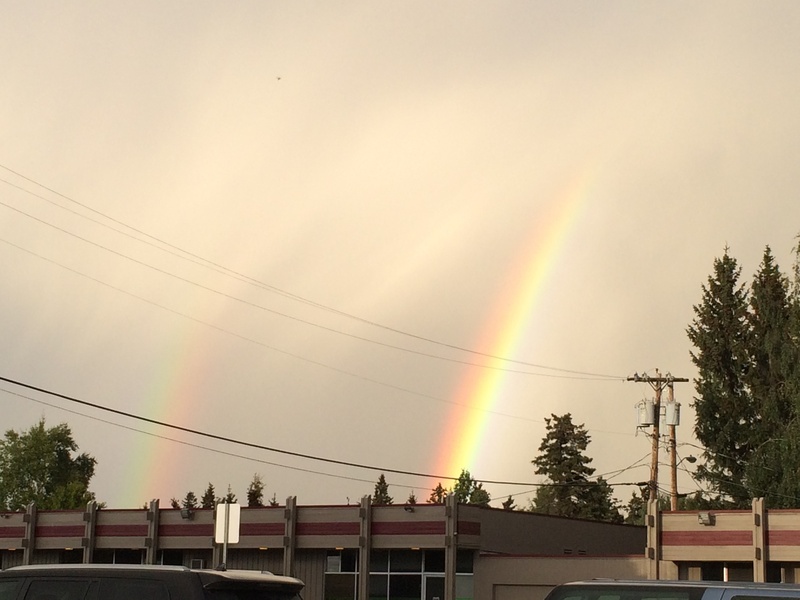 There was a pretty amazing double rainbow and a nice lenticular cloud. 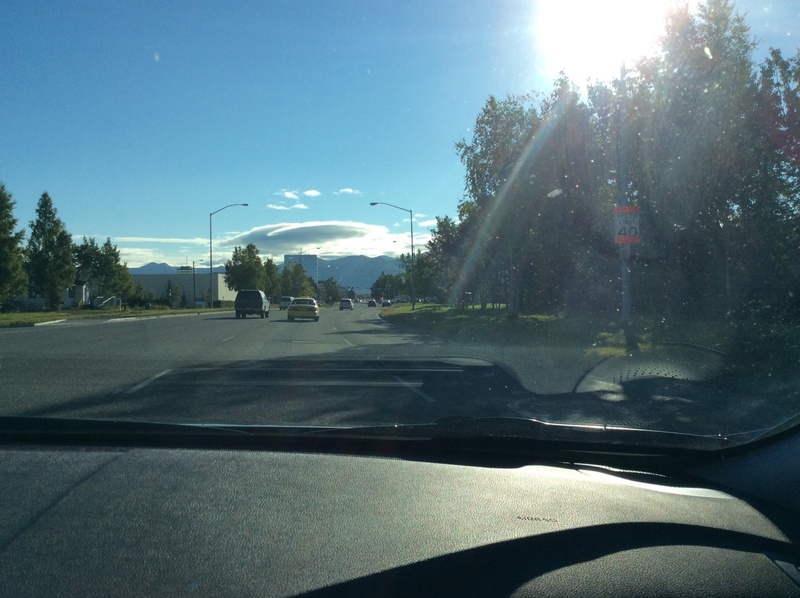 Lenticular cloud over the Church Mts. We flew Icelandair to Reykjavik and then from there to Glasgow. Glasgow was great. The people who live there seem really proud of their city. The cab driver on the way in from the airport was recommending museums, and in particular Christ of Saint John on the Cross by Dali at the Kelvingrove Art Gallery & Musuem. 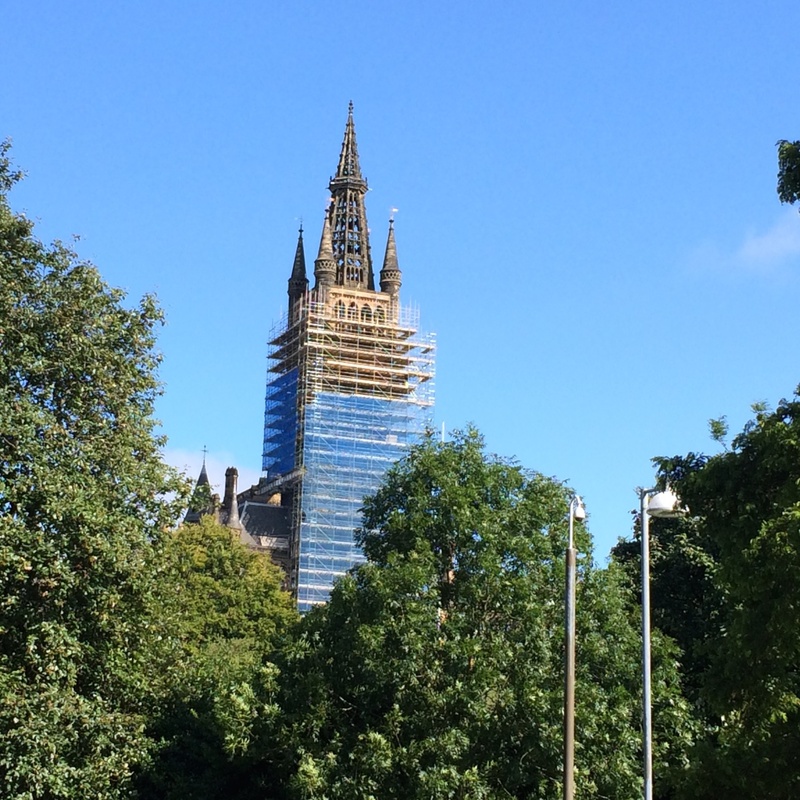 Glasgow was once the second most prosperous city in the UK, and the residents seem to have been very civic-minded. 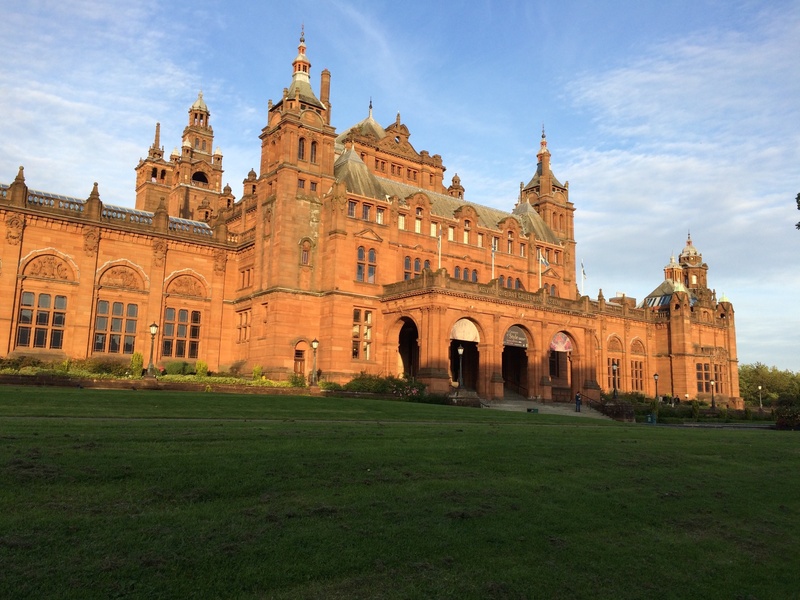 The Kelvingrove was built to house the collections that were donated by prominent Glaswegians, using funds from an international exposition and public subscriptions. It houses a fair bit of Charles Rennie Mackintosh material. We got in a good visit our last day there. Unfortunately, some of the other Mackintosh venues were under renovation. 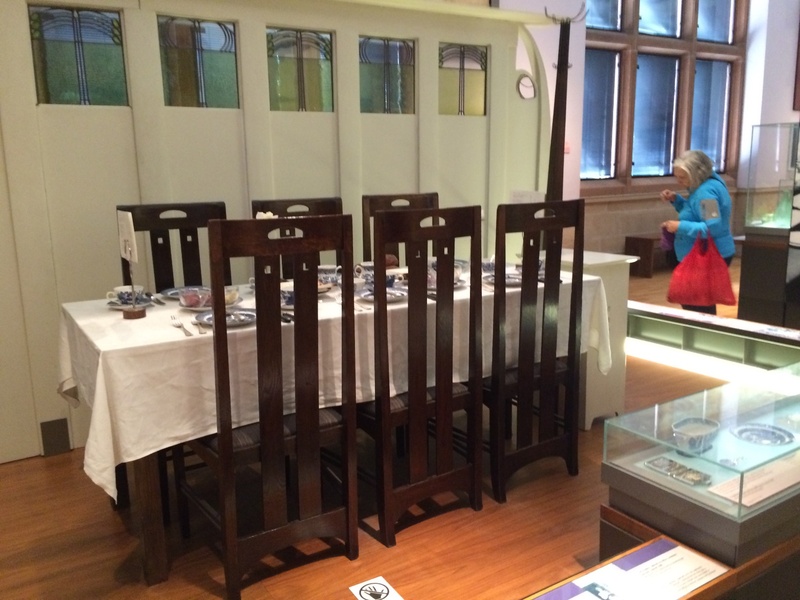 Charles Rennie Mackintosh table & chairs from one of the famous tea room interiors. The meetings were held in various venues at the University, including some very old lecture halls and more modern buildings. We spent most of our time around the University. There were a number of good restaurants & pubs, particularly along Ashton Lane. We tried a bunch of them. 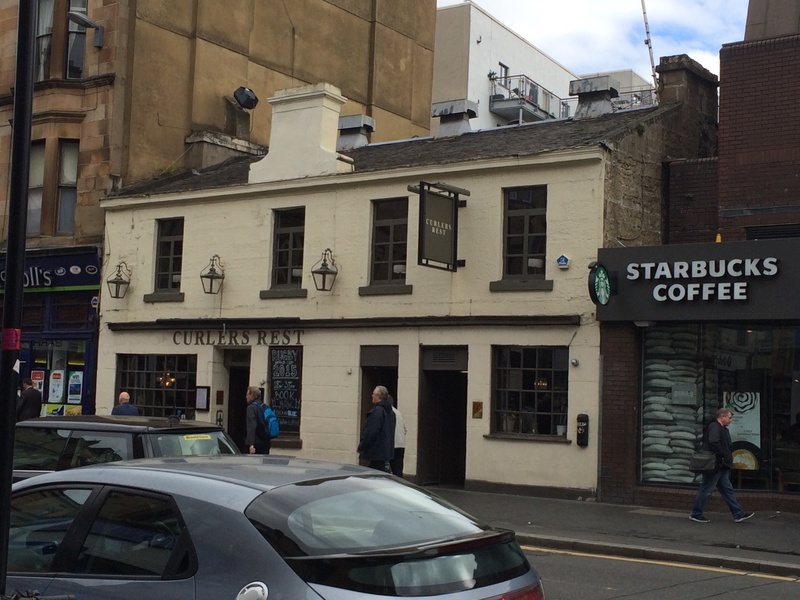 We never made it to this one,which was apparently an isolated inn before Glasgow got so big, near a pond where local curlers used to throw rocks. This is apparently where they went afterwards back then, as curlers are wont to do :-). 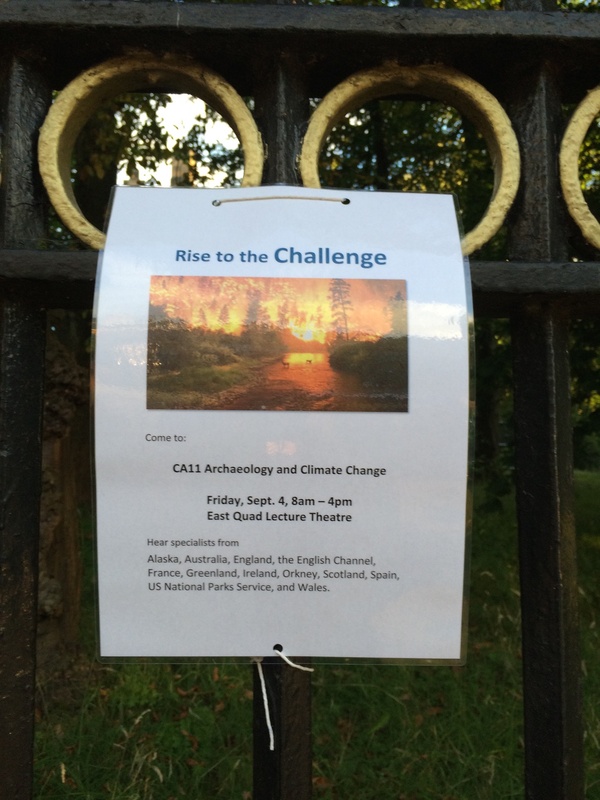 Our session (Archaeology and Climate Change) was heavily advertised. Tom Dawson, the organizer, had managed to get leaflets put up all around campus before the session, so it was very well attended. As you can see, there were participants from all over. I talked about the threats to frozen coastal sites from climate change, with an emphasis on the Barrow area. I was able to incorporate images from the storm that had happened the week before. There were some other pretty bad situations, but none that were worse. On the other hand, some people are making strides in dealing with these issues with public help, which is good given the turn-around time for even successful funding applications. Poster for our session on Archaeology and Climate Change. The conference featured a very nice party, spread across two venues, both within a block of our hotel! 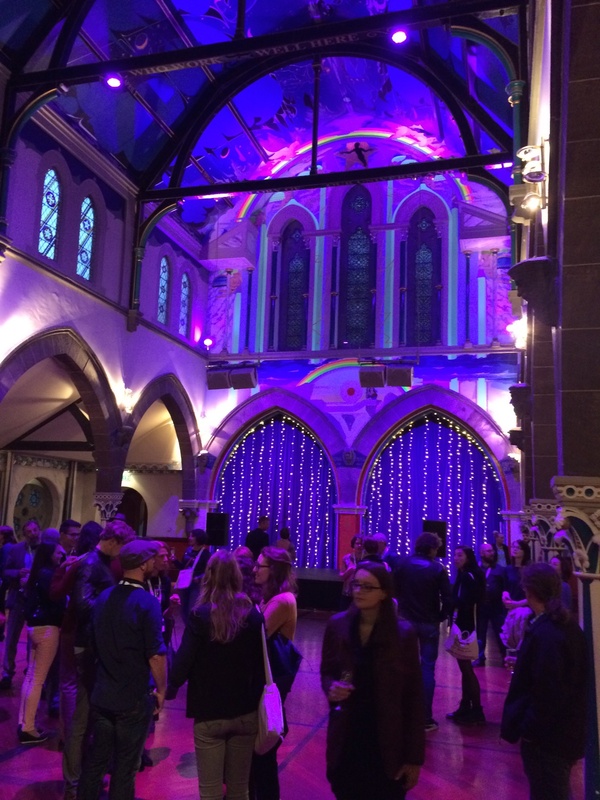 One was Òran Mór, a converted church which now houses performance space and a bar. The upstairs had been rented for the party. It had obviously been redone from its days as a church. 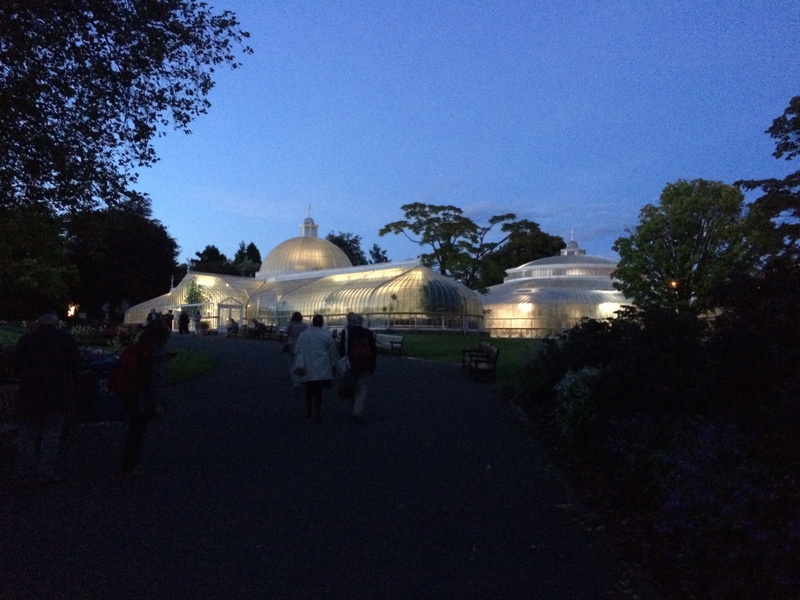 The other was the glass house at the Glasgow Botanic Gardens, just across the way. 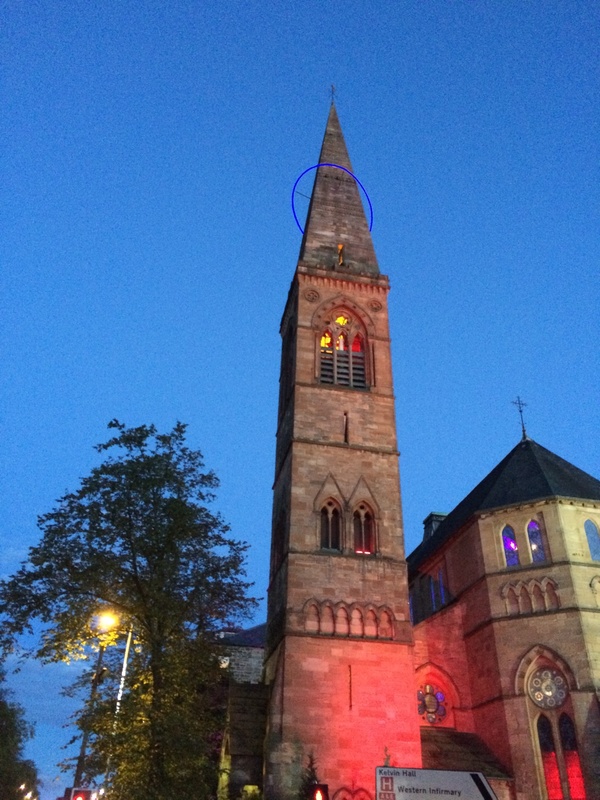 Òran Mór from the outside, with a blue halo on the tower. 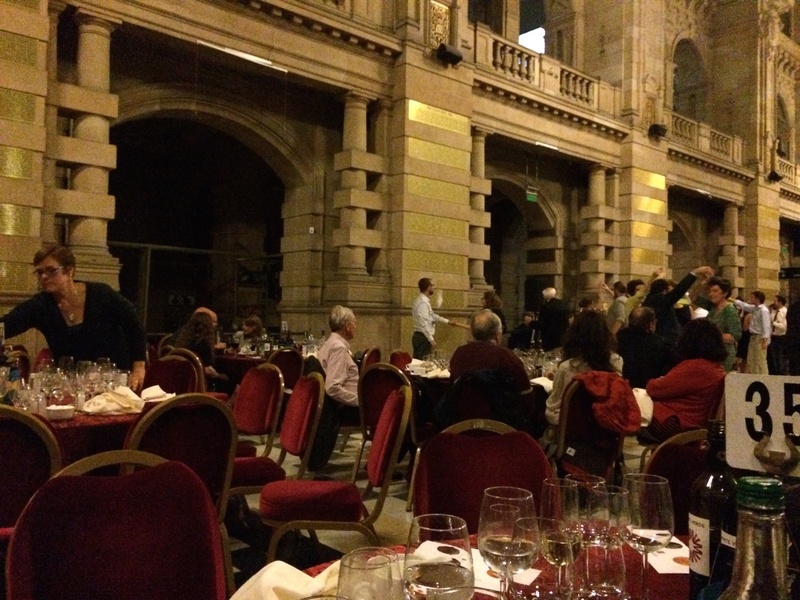 The conference banquet was held in the main hall at the Kelvingrove. It was sponsored by Glenmorangie (the distillery near Glasgow) so there were samples of a couple of their special products. After the speeches and dinner, there was a fine band and dancing. Dancing at Kelvingrove. BT Wygal and Katie Krazinski by pillar at center. DNA results from the North Slope published! When we first started archaeological work at Nuvuk, it took a while to find a physical anthropologist who was willing to work with the human remains here in Barrow. Dennis O’ Rourke and his team were willing to do that. Dennis came up to Barrow to speak to the community and the Elders to get their permission. His lab works with genetic studies as well as skeletal material, and he asked if they would be interested in allowing ancient DNA studies on the remains from Nuvuk. The Elders were not only interested in those studies, they suggested that the group undertake a program of modern DNA studies across the North Slope as well. They developed a proposal to do just that, and once it was funded, research got underway, with resident of all seven North Slope communities contributing samples. The analysis took a while. The team traveled to all the villages to collect the data and returned to present the results to North Slope residents before they were published. Finally, the first paper based on the project is published! It is based on looking at mitochondrial DNA, which is inherited only from your mother. It is present in many more copies than the more familiar (to most people) nuclear DNA, and therefore is often studied in archaeological situations, since all the extra copies make it more likely that some of it will survive. The short version is that the modern DNA results support the North Slope as the source for the populations that migrated to the eastern Arctic, both the Neoeskimo (ancestors of today’s Inuit/Inupiat people) and the earlier Paleoeskimo. This fits well with the picture from the archaeological data. Jennifer Raff is senior author, with Margarita Rzhetskaya, Justin Tackney and Geoff Hayes as co-authors. This paper has gotten picked up by a number of science news sources. Edit: 4/30/15 Fixed a link that WP had put an ellipsis in the middle of the link. It should work now. This summer was unexpectedly quite on the archaeology front. The non-profit through which my grants were run had some problems, which meant that work had to stop and I had to move my grants. This turned into a rather long drawn-out process, with many fits and starts. In the end, I was appointed as a Research Associate in the Department of Anthropology at Bryn Mawr College and the three grants on which I am PI (Principal Investigator) were moved. We are still finalizing moving the purchase orders to allow for work to proceed on the WALRUS grant, but hope to get it done this coming week. We had hoped to be doing some work at Walakpa, which had survived the winter unscathed, but despite the North Slope Borough asking for UIC Science’s Certificate of Insurance, which usually happens when a contract is about to be awarded (good thing, the insurance company charges to issue those things), nothing was issued. Then came the first week in September. I was in Point Hope monitoring the drilling of a geotechnical test hole for a possible fiber project. It took an extra day to get there from Kotzebue, because the weather was so stormy that planes couldn’t land in Point Hope. We didn’t find anything during the drilling, but the extra day gave me a chance to visit with Molly Odell and some other colleagues who had been working in Kotzebue and look at some of what they had recovered during their field season. That was fun, but unfortunately the same storm really did some damage at Walakpa. 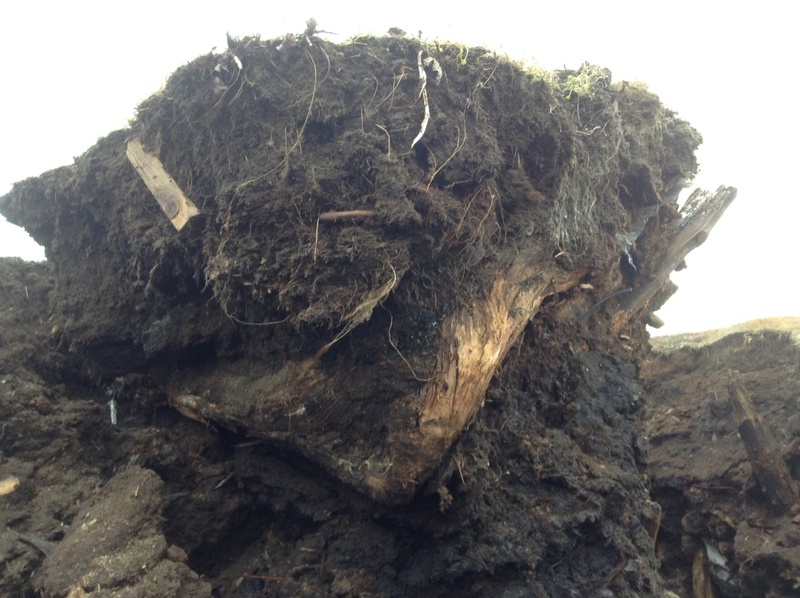 The site was undermined by high surf. Mark Ahsoak Jr. kept me posted (Taikuu Mark) via Facebook message, and it was pretty depressing. In the end, the house we were working on last year seem to have been entirely obliterated. A big slump block broke off and is resting on the beach. Slump block on the right, intact strata on the left. Notice the Visqueen on both sides. I went down with a crew from UIC Science Logistics to evaluate it. We found that there had been a lot more Visqueen under the surface than we had thought. The stratigraphy is very complex, with a very large feature containing solidified marine mammal oil, some artifacts and what appears to be maqtaq at the landward edge of the slump block. 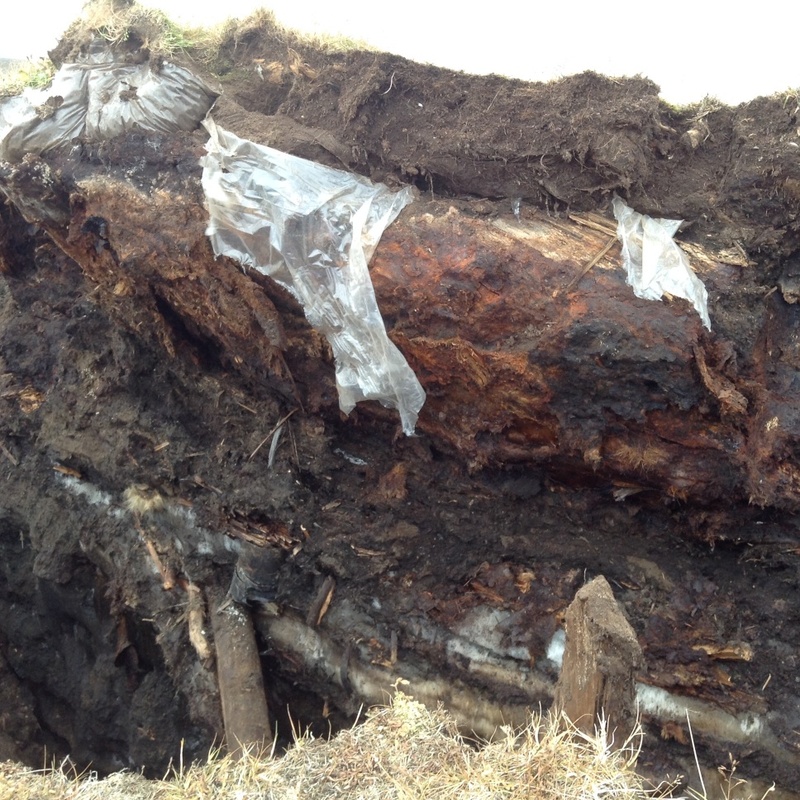 Unfortunately, the marine mammal oil feature is starting to break loose from the main slump block and tip back into the crack between the block and the intact site. We put driftwood props under it, and then stopped all work under the overhang, since it could easily kill someone. Side view of overhanging block of marine mammal oil. Note crack on the left. We didn’t find any loose artifacts, although there were a number of visible artifacts that were frozen in. Some folks had been collecting them and turning them in, which is great. I’d really like to thank everyone who has been helping in this way. Unfortunately, some other people have just been collecting them. Several of the artifacts that we saw the first day were gone by the time we returned. After we headed home, the next day was spent in getting a crew and material to do some stabilization. Several of the Barrow-based UIC subsidiaries pitched in with materials, crew and transport, and we went back to put some temporary protection on the site. We were able to cover almost all the eroding surfaces with geotextile fabric , secured with some cutdown metal support fasteners and sandbags. 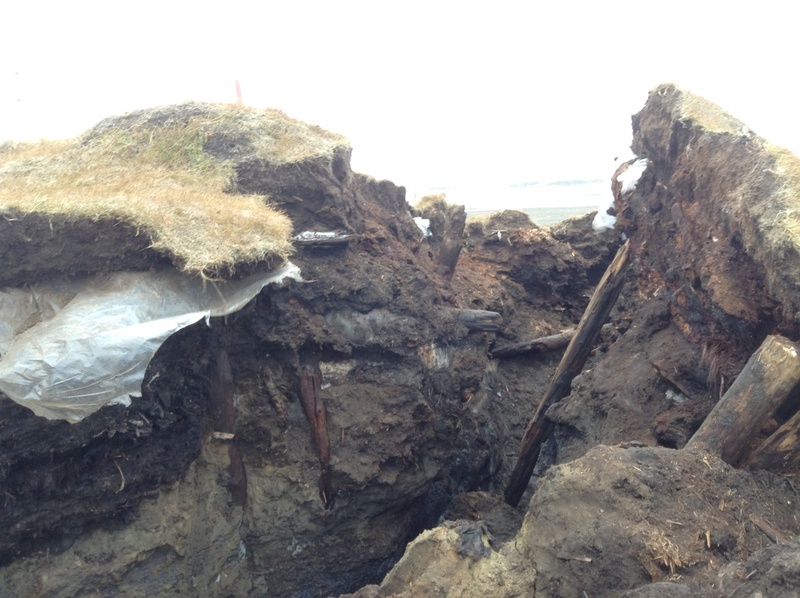 Panorama of the site after the initial covering. We made another trip down with the theodolite to map the new boundaries of the site. This let us document the loss of over 33 feet (11+ m) in that storm alone. We also put a lot more sandbags on the site, and so far it has resisted the weather.